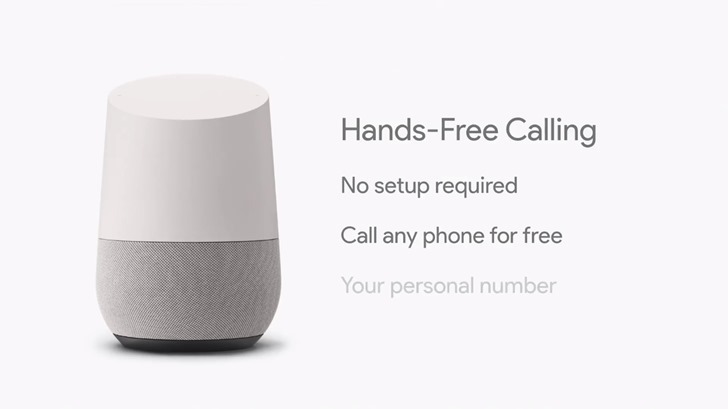 One of the many announcements we saw at Google I/O 2017 was hands-free voice calling for the Google Home. Instead of Alexa's equivalent feature, which requires both people to have an Amazon account, the Google Home would use VoIP to call standard phone numbers. At long last, the feature is starting to roll out. The process is pretty simple, just use commands like, "Hey Google, call Mark." No setup is required, and if you use Google Contacts, then you can just call people by name. If you ask to call a business, Google will look up the number and place the call for you. You can also say "Redial" to call the number again, and "Call them" after looking up a local business. To hang up, you can tap on the top of the Home or say "Stop." The other person will see Unknown or No Caller ID, so you might want to let them know about the new feature beforehand, unless you want your calls ignored. However, if you link your Project Fi or Google Voice number in the Google Home app, you can use that for calling instead. If you use multi-user on the Google Home, then the Home detects the user's voice and uses their contacts. You can still access your Google Home while on a call too. Just press and hold on the top of the Google Home, and the other person will be placed on hold while you ask Assistant a question. The call will automatically resume once Assistant is done talking. However, there are a few important limitations worth mentioning. The Google Home cannot call 911, and international and premium rate (1-900) numbers only work if you link your Voice/Fi number. As mentioned above, this feature is still rolling out, so you might have to wait a week or two to use it. Google didn't explicitly say if the Google Home preview program will get it first, but it's possible.